The Tanjung Datu national park lies on the Datu peninsula at the westernmost tip of Sarawak, 100km northwest of Kuching. With just 14 sq km it is one of the smallest national parks in Sarawak. The park was opened to the public only a few years ago. It only gets on average 30-40 visitors/month. The park has one very long (1km+) and very nice beach of yellow sand. The seawater is clean but not crystal clear, probably because there are small rivers flowing into it. 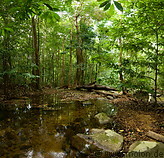 Tanjung Datu NP has a very nice pristine jungle, with a few trails criss-crossing it. The trails are well kept and marked although they are not on plankways, so can become slippery when it rains. The park is totally free of leeches, so that you can walk around even in slippers without risking to be bitten by a leech. On a cliff inside the park there is a site with Rafflesia flowers. The park has no own Accommodation, but you can camp in it. To get to the park you need to get a boat from Sematan. Personally I chartered a boat for a day trip from Sematan and was charged RM450 in June 2009. I have read reports stating that you can go to Teluk Melano, a small Malay village next to the park, by joining the boatsmen of Teluk Melano in Sematan when they return home after shopping in Sematan and only pay RM15 for the boattrip. But in that case you will have to spend at least one night in Teluk Melano, because to go back to Sematan you have to wait for the next day when a boatsman from Teluk Melano goes shopping to Sematan. Beware of travel agencies charging you RM1100 for a tour to Tanjung Datu NP - you can get there for much less - see the link with the report. More information about the Tanjung NP is available on the site of Sarawak forestry and the site of Tourism Malaysia.